well, we made it! friday! 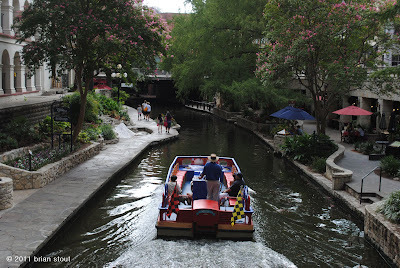 today's photo was taken at the river walk in San Antonio - as was yesterday's stair photo. I'm surprised they'd be able to take a boat down there cuz it's so narrow... did the water splash out of both sides? Ya gotta swing by & see the Texas Longhorn I gota pic of... ya know the one up by Van Buren we always used to see? He's still there! how deep is it in there? tricia needs a trip to SA, she would love it.